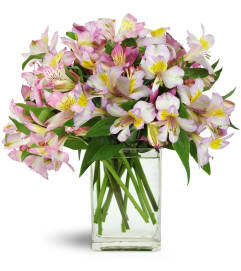 When an average bouquet of flowers won't do, this special floral gift conveys your thoughtfulness with aplomb. 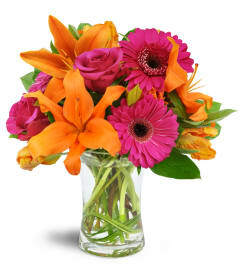 Bursting with colorful, big blooms, smiles are guaranteed when you choose this wonderful floral arrangement. Roses, carnations, purple phlox, and more are all part of the picture. Perfect for birthdays, housewarmings, thank you sentiments, or a lovely hostess gift. 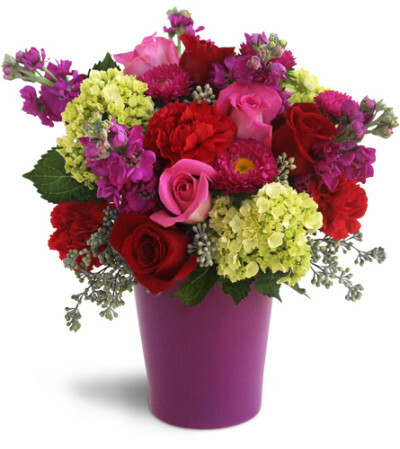 Pink roses, red roses, red carnations, purple phlox, green hydrangeas, and asters are arranged perfectly in a bright magenta vase. Same day delivery and the followers looked just the picture. They were perfect. Thank you. Flowers arrived on time and looked amazing! I will definitely be using this company again. Great place for wedding flowers, when you're on a budget they abide by it. They answer all your questions and are really friendly people. 10/10 would reccomend. Petals and Pots Flower and Gift Shop is a Lovingly Florist in Kitchener. Buying local matters. Discover how Lovingly supports local florists. Copyrighted images herein are used with permission by Petals and Pots Flower and Gift Shop.